The Undergraduate History Council (UHC) is a group of undergraduate representatives for history majors and concentrators. They also serve as student advisors to the Undergraduate Education Committee (UNDED). Membership to the UHC is open each fall by application, and members are expected to serve for at least one full academic year (though standard service length is 1.5 years, typically beginning in the spring of the sophomore or junior year). UHC members engage in a number of independent activities intended to improve undergraduates’ educational experiences in the department. The Columbia Undergraduate History Council (CUHC) is now accepting applications from Sophomores and Juniors! If interested, please find the CUHC Membership Application here. The deadline for CUHC Membership Applications a is Monday, October 1st at 11:59 PM. Congratulations to the UHC members in the Class of 2018: Spencer Cohen, Jenna Lee, James Woodall, and Caroline Zeng! Take a look at Volume 2, Issue 2 of the Columbia Journal of History! For more information, please visit CJH’s website. 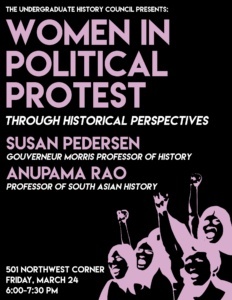 On Friday, May 24th, 2017, the UHC held the panel discussion “Women in Political Protest through Historical Perspectives” with Professors Susan Pedersen and Anupama Rao. On Friday, November 11th, 2016, the UHC held the panel discussion “Capitalism in Crisis? 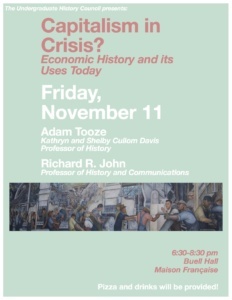 Economic History and its Uses Today” featuring Professors Adam Tooze and Richard John. The UHC is on Facebook and Blogger! We welcome suggestions, comments, questions, and feedback of any sort. The members of UHC can be reached at cuhc@columbia.edu.